I think I found my lost sister whenI first met Frances at Quilt market. Frances has such a warm and kind heart with a flair for colour and design. I love the Safari Moon and Cherie collections and cannot wait until Utopia is released later this year. 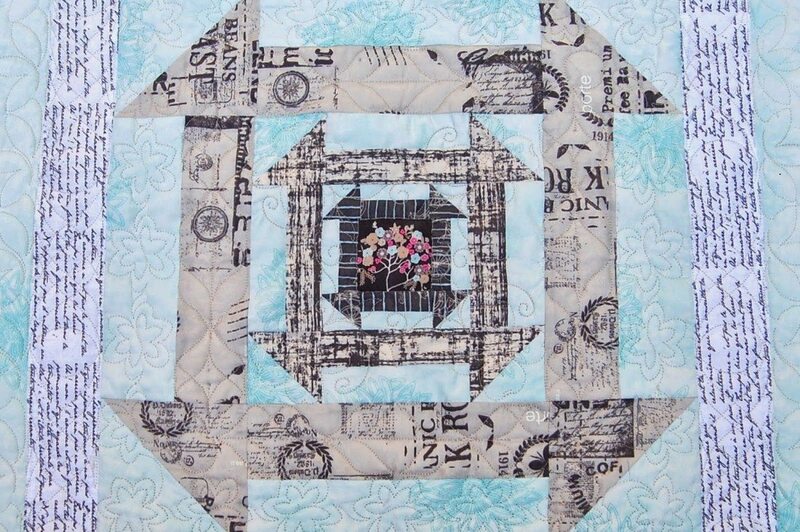 The nested churn dash mini quilt is made using the Cherie and and Icy Blue Floral Elements as the background. It adds such an antique look to the block. To view this magnificent block go here. If you want to learn more about Frances, listen to the wonderful interview with Pat Sloan here. It is quite simple – pinning secures our piecing so the fabric does not shift when sewing. How do we optimise our pinning technique? Invest in a good quality pin. Glass head, fine needle head and sharp point. Throw out bent, blunt or pins with a bur. Use the correct pin type for the correct project. Flat for paper piecing vs ball head pins. Add more pins for curves or to tame pleating. For flat, straight, pieces generally 1 pin per 2″-3″ is required. When joining rows I use a distance of about 1 1/2″ between each pin to support the weight. If you like living on the edge, sew over your pins. 99% of the time nothing happens if you slow down but the occasional needle break will occur and damage the machine (or take out an eye). The needle hitting a metal pin will blunt over time. (Using the titanium tipped needles helps.) Either place the needle away from the sewing path or pull them out as you sew. Which way to pin? I like to place the pins with the tips close to the raw edge. Some like to place the pin head close to the raw edge. Both work well, although I like the tips close to the raw edge and pin head away from the stitch plate. 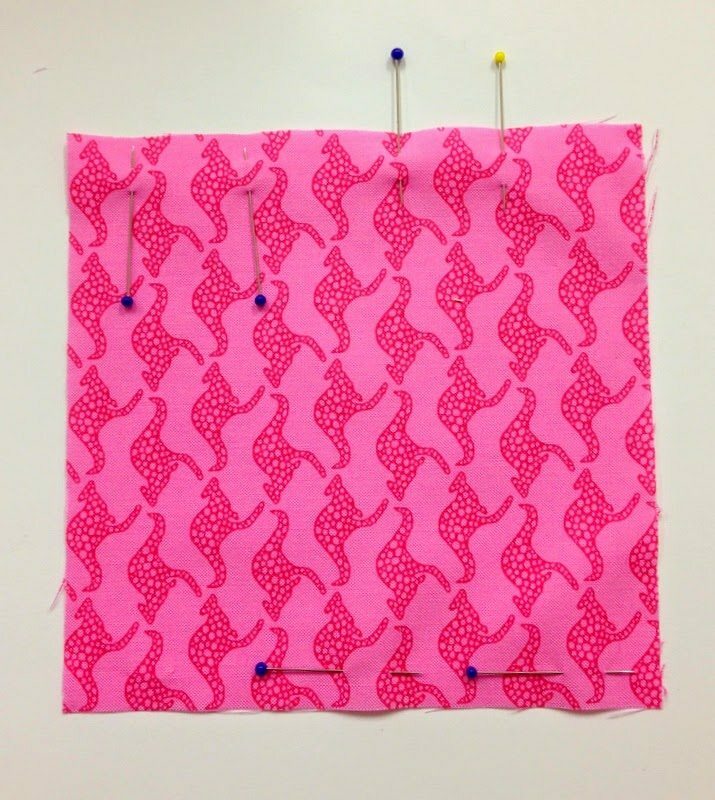 Placing the pins parallel to the raw edge is great for straight stitching. 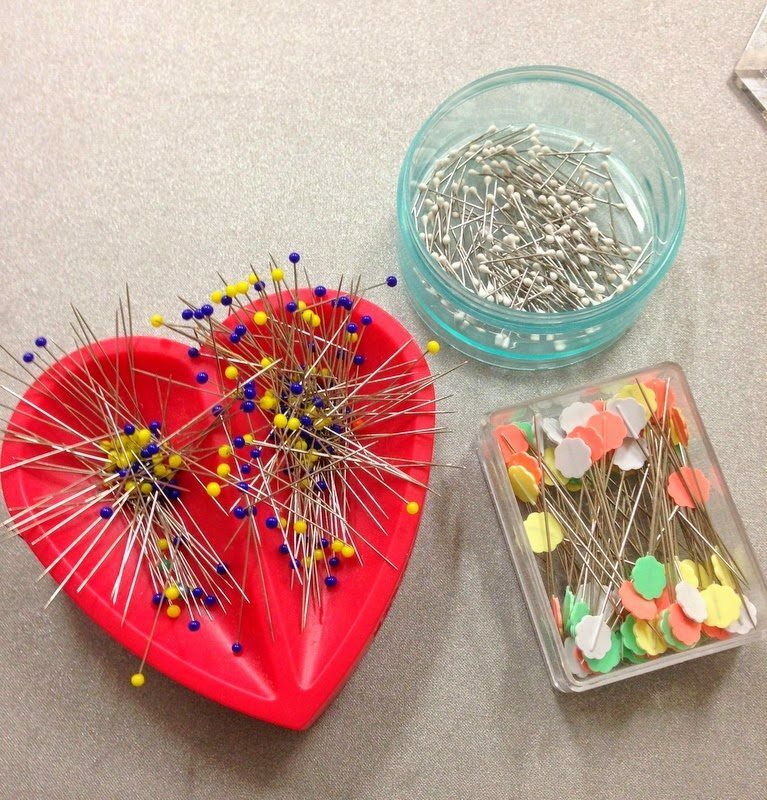 Place the pin heads pointing towards yourself so that the pins can be easily pulled out as you sew. Use a pin dish or pin cushion with a fill that won’t blunt the pin. I have 3 types of pins in my sewing space. I use Clover products because they are readily available to me but there are many quality brands available in the market today. 1. Clover patchwork pins. I like these because they have glass heads and a very fine needle head and sharp point. If I accidentally iron the fabric with the pin in it, the pin head does not melt. The sharp tip means it does not pull on my fabric when pinning through layers. They are also a good length to secure the fabric well and the pin head is a perfect size to grasp and pull out of the fabric. 2. Clover flower head pins. These are my go to pins for foundation piecing (Paper Piecing). They lie flat and do not get caught on the stitch plate when machine sewing. I don’t sew over these pins as they have a thicker needle head and I certainly don’t iron over these pins and the heads will melt. 3. Clover Applique pins. I like these dainty pins to secure my appliqué pieces. I use them in conjunction with appliqué glue. Again, I would not machine sew or iron over the top of them. They are excellent for small, hand sewn appliqué pieces. The thread does not get caught around the pin as you are sewing. In part 2, I will discuss how to pin intersecting seams. 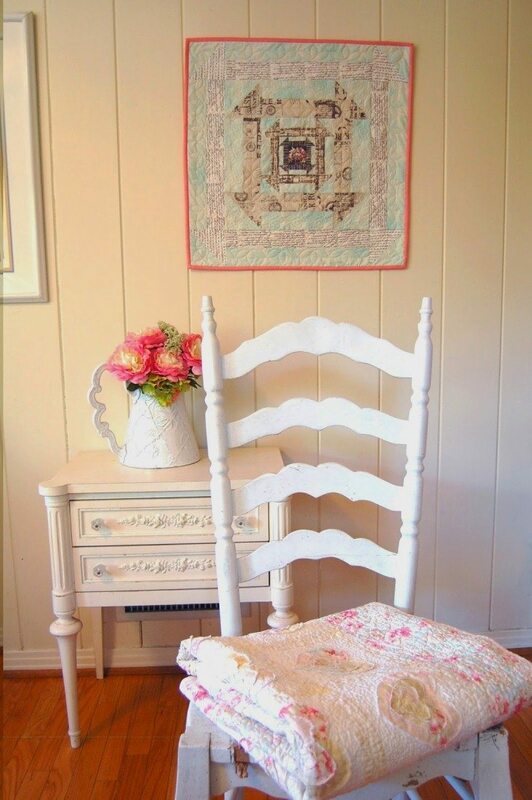 Don’t forget to visit Carrie, Kim, Pat, Lissa and Kimberly and view their gorgeous projects. Thank you so so much for this sweet post Jane, I had such a great time making your gorgeous block! The pattern is just awesome. You are a dear friend. Thank you again for including me. Have you tried using Elmers washable school glue to bind seams? It is indispensable for quick pinning.